The Nam Theun 2 dam is currently the largest hydro-electric power plant in Lao PDR. In spite of being a supposed ‘showpiece’ project, it has been associated to large negative social and environmental impacts. Already in 1927, the site was first described as potential area for a dam project. First studies and concessions followed in the 1990s, but the project was put on ice due to the 1997 Asian financial crisis. It returned on the development agenda in 2003, with the signing of a long-term power purchase agreement between Laos and Thailand, assuring the export of more than 90% of the dam’s generated electricity to Thailand. A consortium of corporations from Thailand, France and Laos was formed to establish the operating company NTPC (Nam Theun 2 Power Company Limited), supported by the World Bank Group and Asian Development Bank. Already since planning, the projects was accompanied by protests of villagers and environmental organizations (1;6;8). Public consultation with affected communities was reported to be inadequate and incomplete (7) and petitions to stop the project were supported by 153 NGO's from 43 countries (9). In spite of these CSO efforts, it was approved by the World Bank on March 31, 2005. Having achieved the largest foreign investment ever in Lao PDR’s hydro-sector, NTPC started the construction in 2005 and commercial operation was ready in April 2010 (1;2). According to a World Bank spokesperson, the Nam Theun 2 dam has been “a project that has seen a lot of thought put into its side-effects on the environment and the local communities” (3;10). However, the dam reality has differed largely from the underlying development rhetoric. Large negative impacts on the environment and communities have been associated to the project, which have not been accounted for, or properly compensated. While the 6,200 displaced indigenous people may have better physical infrastructure in their newly build villages, the quality of the land plots received for compensation has been questioned. While some villagers may be better off, others are facing food shortages. In spite of governmental livelihood programs, many questions remain open regarding the long-term opportunities of the resettled. In downstream communities, over 110,000 people face increasing problems of poor water quality and decreasing fish catch – impacts that have not been accounted for, or not fully compensated. Women and indigenous communities seem to be more affected, unable to take advantage from official compensation programs. Regarding environmental issues, an area of 45,300ha needed to be flooded. The establishment of a large protected area surrounding the dam was argued to improve governance of natural reserves. However, the dam construction opened new access-ways into the forest, facilitating increased illegal logging such as rosewood, and poaching of wildlife (4;7). 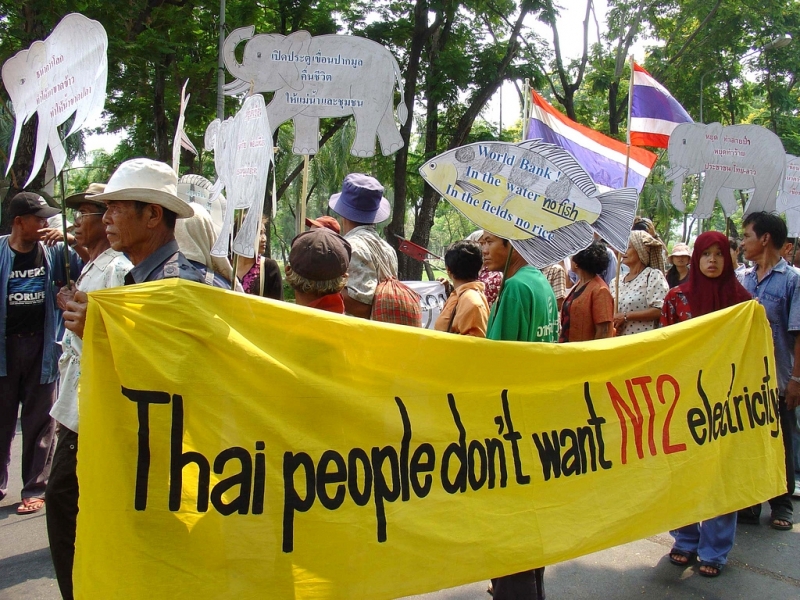 Too late, also World Bank consultants involved in the project realized that the “Nam Theun 2 confirmed […]that the task of building a large dam is just too complex and too damaging to priceless natural resources,” (5). Bearing in mind that the produced electricity does not benefit the area, but mainly neighbouring Thailand, the Nam Theun 2 dam can be understood as cross-border land grab for energy production, in which the benefits in terms of electricity and financial revenues have been largely appropriated by foreign countries and international corporations, while heavy social and environmental costs have been carried by local communities. Electricité de France International (40%); the Electricity Generating Company of Thailand (35%); and Lao Holding State Enterprise (25%) (1). Expected revenues for the Lao government amount to 1,9 - 2 billion dollars over the period of the first 25 years of operation (3). The reservoir capacity covers 45,300 ha of forest area (1). The flooding of the area required the displacement of 6,200 indigenous people (2). in the course of construction, a nationally protected area was established, covering 400,000ha (1). Development of Alternatives The alternative proposal by villagers and environmentalists was to keep the area as it was. However, this was not achieved, and affected communities had to accept the alternative proposed by the project leaders - insufficient compensations. Why? Explain briefly. The project was finished and is now in operation.